I'm Harriet, I'm 14 years old and I was born in North Devon. I love my family and friends, music, drawing, concerts and shopping! When I was 11 months old, I was diagnosed with Cystic Fibrosis, an illness which mainly effects the lungs and digestive system. I have had lots of lung infections throughout my life, and lots of hospital stays. Despite this, I have generally kept very active and got on well with life until earlier this year, when a lot of things started to take a turn for the worst. At first my breathing got gradually worse and I slowly started losing weight, despite continuing to eat well. I spent virtually the whole of the summer in Barnstaple hospital on IV antibiotics and lots of other oral and nebulised drugs, but kept losing weight and became more and more exhausted. In August, I became even more unwell, spiking very high temperatures everyday for two weeks. Despite this rapid deterioration, the consultant at Barnstaple refused to make any changes to my treatment! 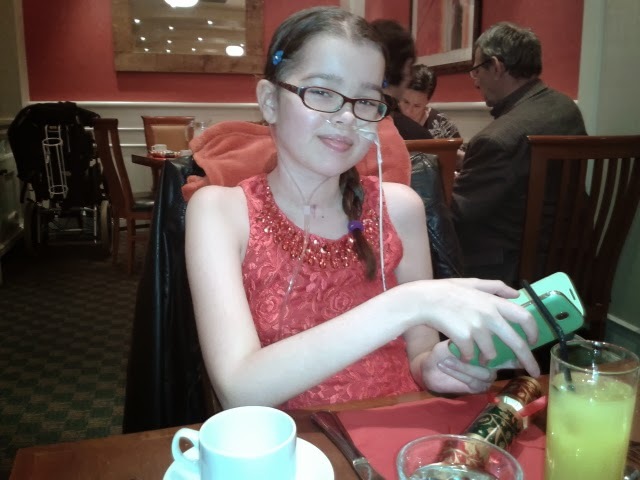 On the 29th of August, my sister's birthday, I became so exhausted and my oxygen saturation became so low, that I was placed in High Dependency. Two days later, I was transferred by ambulance to Exeter's High Dependency Unit, as this was the nearest hospital with Intensive Care facilities. I spent 4 horrible days there, and got more and more exhausted, made worse by being given very toxic drugs. By the 2nd of September, I was unable to clear all of the increasing secretions on my lungs, because of my exhaustion, and ineffective physio techniques being used. I became less and less conscious as my body struggled more to cope. I can't remember the last three days in Exeter. My blood began to become acidic and my blood albumin (protein) levels and haemaglobin levels began to drop. I was given intravenous albumin and a blood transfusion. The physiotherapists were coming in every hour, but the physio techniques that they were using were hugely inadequate and futile. On the morning of the 4th of September, my heart rate, which had been racing for days at 160/170 beats per minute suddenly dropped into the 30's before climbing back up. My nurse hit the Emergency button and lots of doctors and nurses immediately rushed to my bedside. 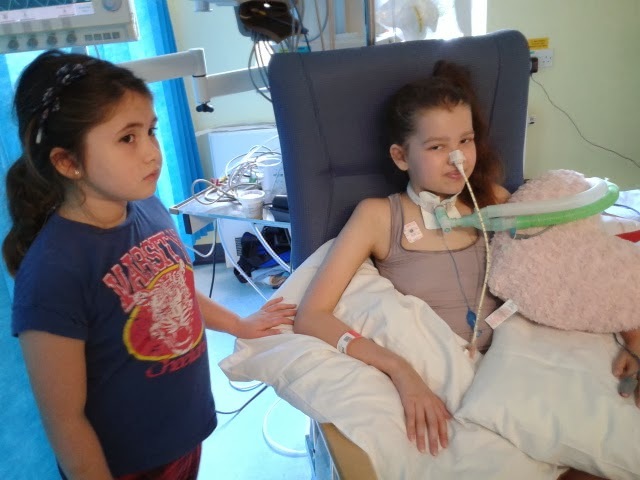 The Intensive Care consultant said that this was a sign that my body was starting to lose the battle, and that they had no choice but to intubate and place me on a ventilator. So I was rushed to Intensive Care. The IC consultant told my family that she didn't know if the ventilator would be able to do it's job, as my lungs may have been in too bad a condition. She said she thought I had a 50/50 chance. My family said that they knew that God doesn't deal with chances, and so as I was rushed to Intensive Care, they prayed hard, and the ventilator worked! So, the intensive care consultant told my Mom, Dad and my little sister that after some initial resistance from my lungs the ventilator seemed to have cleared a load of secretions which had probably been plugging up the airways, and the ventilator started working much better than she had thought it would. I had to be completely sedated, and I was being ventilated via an endotracheal tube. When Mom and Dad were allowed in to see me, they said that I look really peaceful and comfortable for the first time in a long time. In the afternoon on 4th September the Transport Team, which consisted of an IC consultant, an IC doctor and an IC nurse, came from Bristol's Paediatric Intensive Care Unit came to Exeter to take me to Bristol. When I arrived in Bristol I still had a temperature of 40 degrees, and they placed a special kind of cold blanket underneath me to help bring it down. They also had to give me a muscle relaxant to stop me from shivering with it. At this point, my CRPs (infection markers) were 400. I spent the next 7 days under complete sedation (midazolam), and on pain relief (fentanyl), along with a lot of other intravenous and naso-gastric administered drugs. My CRPs, which had been rising since early in August started falling, and although I still had daily high temperatures, they were generally lower than they had been. One of the undesirable effects of Midazolam and Fentanyl is that they push down respiratory drive, and the longer that this is maintained, the more the body learns to rely on the artificial ventilation. On the 7th day the IC consultants decided to try to wean down my sedation, but by the following morning they had completely stopped the sedation. I was now awake, and vomiting on my endotracheal tube, so they took the decision at 7am to take the tube out, and to aid my ventilation with a non-invasive device called a bipap machine. After 8 hours on the bipap, it was clear that my body was working too hard, as my respiratory rate and heart rate had rocketed again. The consultants realised that it was too soon to extubate, and that I still needed the support from the ventilator. I was re-sedated and re-intubated. 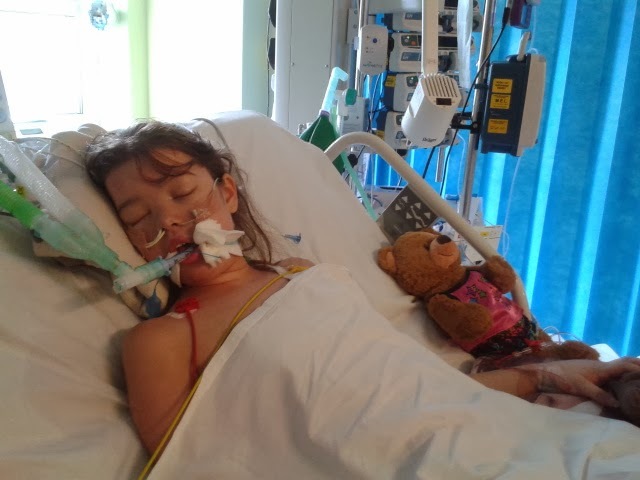 After another two and a half weeks, the IC consultants and the Respiratory Consultant said that I needed to be weaned off the ventilator, and that in order to achieve that I would need to be brought out of sedation. The only way for me to be able to tolerate being ventilated whilst awake would be to ventilate via a tracheostomy tube instead of the endo-tracheal tube. The ENT surgeons performed a tracheostomy in order to put in a "trachie" tube, and this allowed me to be weaned off the sedation and fentanyl. Also, the doctors began to slowly wean down the support settings of the ventilator. It was a horrible, scary time while I was being weaned off the sedation. I was still totally unaware off what had happened to me during the previous three weeks, and where I now was. Midazolam in particular, is a drug which causes weird hallucinations, and so I had an upsetting time over the course of about a week, where I was very scared and confused, and unable to decipher reality. Midazolam and Fentanyl are both drugs which you become dependent on, if you are on them for an extended period of time, and so for some weeks I experienced withdrawal symptoms such as shakiness and twitching muscles in my limbs and face. I had extreme weakness, and was hardly able to move. As some of the toxic drugs (Voriconazole and Amphotericin B) which I had been on can cause neuropathy (problems with nerve conduction), I had to have special tests for this. The tests showed that my nerve impulses were okay, but that I was suffering from a severe myopathy (muscle weakness). This was probably caused by the toxic drugs, my general weight loss and muscle wastage, and generally being extremely ill.
Physio was no longer going to be only chest clearance, but I was also going to have to start building my muscle mass and strength up again, and learn to walk again. Because I was still on the ventilator, I was still unable to eat, so I was still being fed through a naso-gastric tube, but this caused all kinds of problems in itself. I had a lot of stomach pain and problems with nausea and sickness, which caused me to lose even more weight. This went on for a long time, and at my lowest, my weight was measured at 36.15 kg. I was 45 kg when I went into High Dependency, and back in February 2013, I was 59 kg, which was an unusually good weight for someone with CF. When you have CF, the more weight you have on you, the better, as this helps make you be stronger and means you have more in reserve when you are fighting infection. 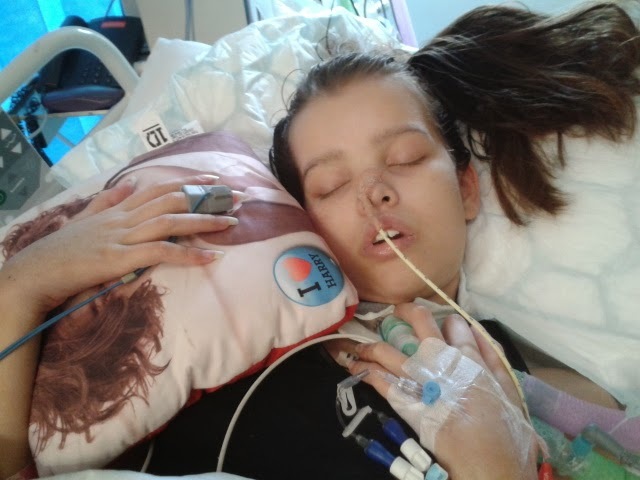 Being in Intensive Care was a really scary experience for me. Most other patients on the unit were younger than me and sedated. I hated the fact that my parents and sister had to leave me at night as in Barnstaple hospital one parent was always allowed to stay the night with me. As I had a trachie in, I couldn't speak or make any sound, so I often worried when I was left alone. On October 7th, I had a setback. I had severe pain in the back of my right shoulder, and my oxygen saturation levels began to drop drastically. My physio, Sophie, was bleeped, and started to give some intensive physio, to clear any potential blockage in the lungs, but despite this my oxygen saturation levels did not come up. Sophie and the doctors listened to my chest, and could hear no air entry on the left side. They immediately ordered a chest x-ray, and the radiologist arrived with the x-ray machine at the bedside minutes later. The x-ray showed that I had suffered a a huge pneumothorax, and my entire left lung had completely collapsed. The doctors gave me some anaesthetic, pushed a huge needle through my chest to release the air from the pleural cavity, and inserted a chest drain. The chest drain was very tender, and this hampered my physio. The chest drain had done its job, and the hole in my lung had healed up sufficiently to allow the chest drain to be removed on the 13th of October. On October 14th, I started the process of trying to wean off the ventilator. The body learns to rely on the support that the ventilator gives it and the longer that this continues, the more untrained the body becomes, and the more reliant on the ventilatory support it becomes. So, the weaning process is vital in retraining the body to breath and ventilate by itself. The first day I only managed 8 minutes off the ventilator. This was a very uncomfortable and scary 8 minutes! The following day I did 20 minutes, then 42 minutes the next day. This allowed me to leave the intensive care unit for a very brief time, for the first time in 6 weeks, with an entourage of 3 physiotherapists, my nurse and mom, dad and sister. By 20th October, I had built up to two sessions in a day off the ventilator (firstly for 1 hour and secondly for 50 minutes), and on the 21st of October, I spent 1 hour 40 minutes and 1 hour 20 minutes off the ventilator. On the evening of the 21st of October, the doctors decided to add in a new nebulised anti-fungal agent. This was the same toxic drug which I had been put on when I first went into High Dependency, and one which we now believe has caused me a lot of additional problems. Throughout the night I had a high temperature. On October 22nd, my chest secretions had suddenly become very dark and thick again, and my heart rate was elevated. Following my afternoon chest physio, I suffered another pneumothorax, this time on my right side. This necessitated another chest drain, and my ventilator support settings to be increased slightly again. This was a major blow, and another setback. Over the next week I struggled to get back on track with weaning off the ventilator, and the chest drain caused me much more pain and discomfort than the previous one. I got very depressed, but still kept trying to come of the the ventilator for short periods of time. For the next week I struggled, and couldn't quite manage to get back on track with weaning off the ventilator, only managing shorter intervals. A week later, the physiotherapists had the idea of taking me up to the adolescent ward for a visit whilst off the ventilator. This gave me a psychological boost, and I managed longer times off the ventilator again. My physios, Sophie and Christina decided to put together some plans, and Sophie went home and spent a lot of time and effort on creating a lovely wallchart, which we started to track my daily progress on. 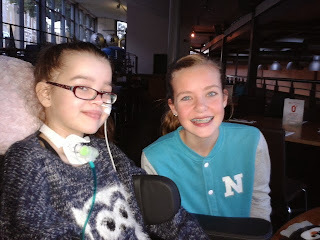 On the 9th of November I spent my first full 24 hour period off the ventilator. This then rolled into 48 hours, at which point I was told that I was ready to leave intensive care, and could leave as soon the ward had a bed space available for me. I waited nearly two weeks, and it turned out that beds were becoming available, but because I still had a trachie in, the adolescent ward didn't feel that they had the right level of nursing staff cover to accept me onto the ward. I started going outside for an hour or two on a few occasions too, which was difficult, and I felt really tired and got headaches. On Thursday 21st November, a multi-disciplinary team meeting was held, and the senior IC physio, Christina attended and very forcefully put across her opinion that I no longer needed the trachie tube in, and that it had served its purpose (to aid weaning off the ventilator), and was now more of a hindrance. The decision was made to extubate, and the following day my trachie was taken out - it was such a relief! 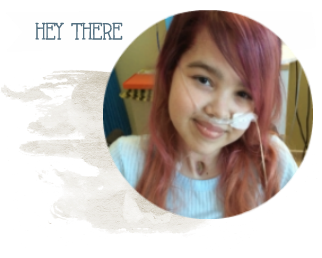 On Saturday 23rd November, after spending 80 days in Intensive Care, I was told that a bed was available for me up on the adolescent ward, and I left the Intensive Care Unit late that afternoon! The adolescent ward is luxury compared to intensive care! I have my own cubicle, which has a bed for my mom or dad to stop in too, and I have decorated it with One Direction posters! The ward has three areas where patients can go to and relax. They have a jukebox room with board games and music, a 'Snug' room with comfy sofas, an Xbox and DVD's and a lounge with a 3D TV! In my time at the hospital, I've had lots of my family and friends visiting me! My best friend Phoebe from North Devon made me a card and got everyone at school to sign it and write little messages of support to me which was lovely to read! I've had lots of cards and gifts from family, friends and people at school as well, and I appreciate all the kind messages of support I've had through Facebook. I've started going down to clinic every week for a lung function - my first lung function was very low as expected, at 19%, but each week it's slowly going up. Since I've been on the ward, I have started a long-acting insulin, called Levamir, as I suffered a lot of low blood sugars, perhaps as a result of high blood sugars, at the start of the year, however the consultant at Barnstaple never really took action. It's a bit annoying, as it's just another thing to deal with, but I don't mind too much, as the insulin is only once a day and it doesn't hurt a lot when the needle goes in. Every night I have an overnight feed through my NG tube called Peritive to add in some extra calories, as sometimes I feel too sick to eat a lot during the day, although my feed sometimes makes me feel sick too! However, I am slowly putting weight on, and at my last weigh in I was 38.4 kilograms. I go to the gym for physio on most weekdays to build up my strength. I try to walk a little further each time I go there, and I've even begun climbing stairs! I also use the excercise bike and on Friday I used the treadmill for the first time! It is all very tiring, but I'm determined to get back to how I was before, so I can go out without needing a wheelchair and breathe without needing extra oxygen! I was allowed to come out of the hospital for 3 nights and 4 days for Christmas! We left the hospital on Christmas Eve, and drove to a lodge in Cheddar, which is about 18 miles away from Bristol Children's Hospital. It felt amazing getting out of hospital for once, and just being able to relax with my family! My Nanny, Grandad and Auntie Saffron came to stay with us, and they brought my dog Cookie with them, who I hadn't seen for months! On Christmas Day, I woke early and unwrapped all of my presents - I loved everything I got, but my favourite thing was my new Canon camera from mum and dad! I ate lots of delicious food and relaxed watching the One Direction movie for the first time! My Auntie Sian, Uncle David and cousins, Tyler and Gabe, visited us on Christmas Day, and my cousins went in the hot tub at the lodge with my sister, Imogen, even though it was freezing outside! I had a great time, and didn't want to leave. On Thursday, we have a Discharge Planning Meeting, to plan when I can leave hospital! I'm excited, and hope I can come out soon! Thank you for reading my (very long) first blog post, and I hope you liked it :) If you'd like to message me, you can reach me through Twitter, Facebook or Instagram! Hi Harriet, you don't know me I am one of your cousins friends - Tyler. You've gone through such a lot at such a young age - you're an inspiration! you must be such a strong young lady and it's incredible what you've done. I wish you and your family all the best and hope everything continues to get better for the future! "Harry is my Lovely beautiful and Brave Angel Granddaughter A Precious Gift from God ,I Love her so very much . She is such a fighter, a soldierxxxxxxxxxxxxxxxxxKeep up the fight my precious Jesus loves you and will protect you and strengthen youxxxxxxxxxxx Love and Blessings your Nanny. "